Letter from Herman Buckman, resident of Muscotah, Kansas, to Governor Arthur Capper of Topeka. Buckman, who was born in Germany and lived in the U.S. for 30 years at the time he wrote the letter, wants clarification regarding the process for the naturalization of foreign-born citizens. In addition, Buckman wants to know if his entire family would be deported along with him if deportation, rather than naturalization, was his fate. 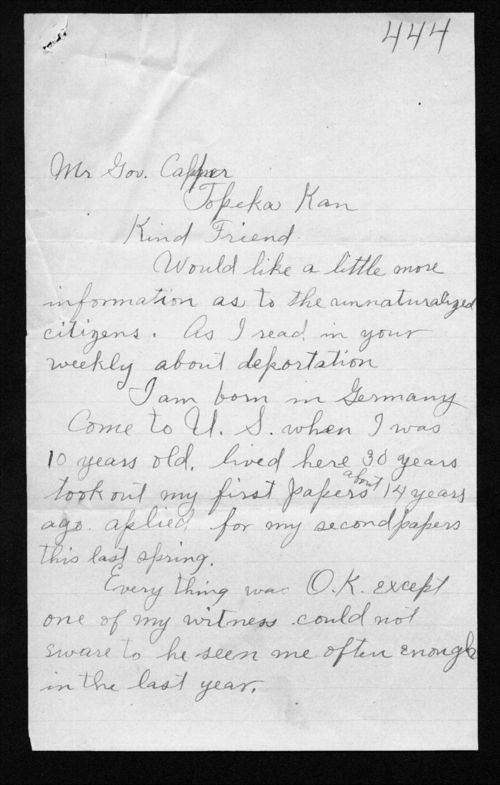 Buckman's letter to Capper can be used to help students understand the uncertainty many German-Americans living in Kansas faced during the anti-German backlash that occurred in the U.S. during World War I.
KS: 11th: 1.7.: challenges German Americans faced in Kansas during World War I.